Review | There's adventure and there's adventure. There's the kind of adventure where unchartered territories are explored on the farthest corners of the planet. In that case an off-roader is the vehicle of choice. But even the toughest adventurer may someday start a family. After that, the adventures are limited to winter sports or briefly leaving the tarmac for a picnic on a sunny day. For the latter group of adventurers, Seat now introduces the Alhambra 4x4. 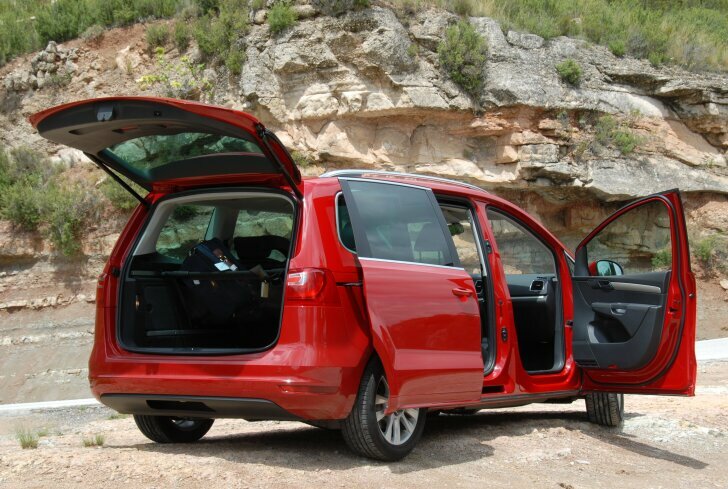 The Seat Alhambra is a seven-seater family car where space goes above everything else. The Alhambra is shaped roughly like a box, because that gives the most cabin space. A functional car like this is also known as an MPV ("Multi Purpose Vehicle"). This space miracle could be called a "van", but that would not do the designers justice. Without compromising on space, Seat did everything possible to make this huge car look attractive. To quote the designer: "Great design is hard not to love". To achieve this he opted for simple, sharp lines which give this boxy car a dynamic look. Also: a bright colour works wonders on its looks. On the inside the comparison with a van also goes wrong. 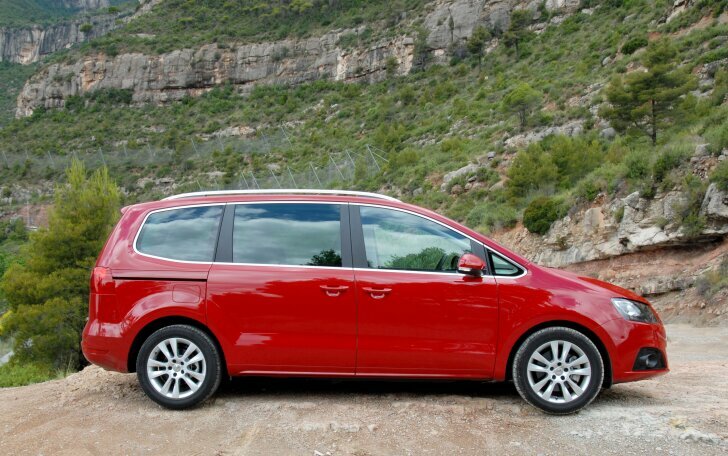 The Alhambra has been designed together with Volkswagen (VW sells the same car under the name "Sharan"). The Volkswagen touch is obvious in the clean yet robust set-up of the dashboard. The spec level is comparable to that of any traditional car in this price range. For example, the test car is fitted with electrically adjustable seats, a parking camera, dual zone climate control and a well-functioning audio and navigation system. The parking brake is operated electrically, but that is more of a con than a pro. Car designers usually go for an electric parking brake to save space, but the space saved here doesn't serve any specific purpose. Instead, the parking brake is so slow that it doesn't add any luxury and is merely annoying. The cabin space is vast, as can be expected from a car this size. Both the driver and front passenger have a high seating position while there's lots of space to move around. A glance in the mirror gives the idea of driving a house rather than a car! The room in the second row of seats is huge as well. Even when both front seats are moved to the back, the legroom in the rear is still excellent. The "back seat" actually consists of three individually adjustable seats. The rear passengers have the luxury of their own air ducts, foldable tables (airplane style) and a 12 volt outlet. Behind the back seat two extra seats can be found. These aren't just meant for small children, even adults can sit here comfortably. When all seven seats are in use, the boot is minimal. Depending on the number of seats in use, the luggage space varies from 267 to 1,339 litres. The low threshhold makes loading and unloading easy. Optionally the Alhambra can be fitted with an electric boot lid and electric doors. Just like the parking brake they operate too slowly and therefore aren't convenient at all. The Alhambra doesn't just have the same spec level as a luxury car, it also offers comparable levels of comfort. On bad roads suspension filters out the bumps nicely, while hardly tilting during cornering. Only in short, quick bends is the Alhambra noticeably heavy. In this case the front tyres lose grip and skid before any traditional car would. The standard electronic stability system ("ESP") handles this very well, but still it's advisable to drive a bit more carefully than normal. When powered by the 170 PS "2.0 TDI" diesel engine, the Alhambra is almost too fast. It takes a lot of self control to drive calmly and many go trough through like a bully with this big, fast vehicle. The 140 PS diesel suits this family car better. Both in the city and on highways performance is still good. Only in the mountains does the 140 PS diesel have to work hard. The 140 PS diesel engine is also available with four-wheel drive. That doesn't turn this MPV into an off-roader. It does offer extra safety in extreme weather or on bad surfaces. The Alhambra 4x4 can also handle dirt roads or sand better than the base model. The four-wheel drive system is controlled by a so-called "Haldex" system. This mechanical gadget transfers the power of the engine to the front wheels under normal circumstances. Only when necessary, the rear wheels receive power as well. Depending on the situation, the engine power is distributed over the front and rear wheels; the driver doesn't have to do a thing. Because four-wheel drive is only active when required, the 4x4 is almost as economic to run as the normal Alhambra (only the extra weight of the mechanics make the 4x4 a bit less frugal). After an adventurous photo shoot on the mountain tops, a different version of the Alhambra was used for the journey back home. Recently a new 115 PS / 280 Nm diesel engine has been added to the line-up. Despite its "EcoMotive" label, this power train isn't especially "eco". Its fuel economy as well as CO2 emissions, are equal to the 140 PS version. The "EcoMotive" doesn't offer any tax discounts and is only meant to be the cheapest Alhambra on the price list. The 115 horsepower should not have been 114, the engine is just strong enough. This base Alhambra is as quiet as the other versions. When driving along with traffic it is hardly noticeable that this is the base model. However, when trying to accelerate, the engine simply doesn't deliver until a lower gear is engaged. Thanks to several fuel saving systems (stop/start mechanism, shift indicator, tyres with low rolling resistance) and because the car almost forces the driver to go slow, the test drive took just 5.5 litres per 100 km (51.4 mpg); just like Seat promises. Seat is doing very well. The factory is running at maximum capacity and only six months after introducing the new model already 19,000 units of the new Alhambra have been sold. To build on that success, two new versions have now been added. To make the Alhambra available to a larger audience, the full size MPV is now fitted with a 115 PS diesel engine. This base model drives as such: it is just powerful enough to go with the flow. Those wanting more than that had better save up for a more powerful version. Despite its low power output, the 115 PS Alhambra isn't any more frugal than the 140 PS model. 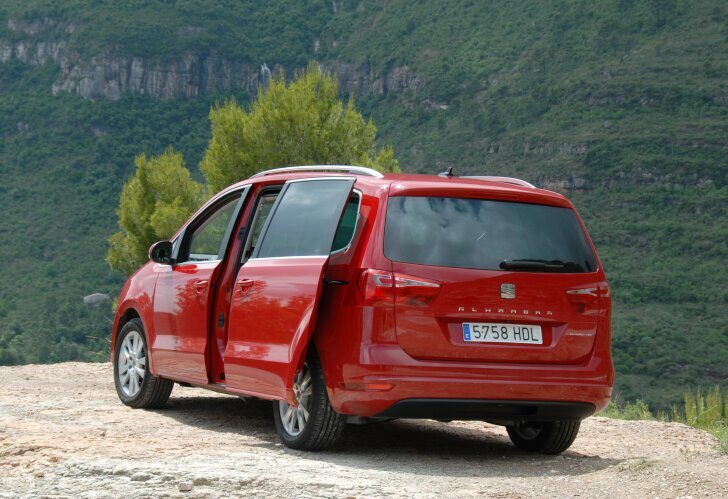 To make this "Multi Purpose Vehicle" (MPV) even more versatile, the Alhambra is now available with four-wheel drive. This doesn't turn it into an off-roader, but it does increase safety and usability.